The gas-powered 2016 Nissan Titan XD will launch in Canada this spring as a four-wheel drive crew cab model starting at $44,900—$7,500 less than its diesel-powered sibling. Powered by a new 5.6-litre V8 that makes 390 horsepower and 401 lb.-ft. of torque, the gas version of the pickup joins the Cummins diesel-powered Titan XD already on sale. Nissan said the gas-powered truck will "initially" be available in five trim levels, all of which are crew cab configurations underpinned by a four-wheel drive setup. 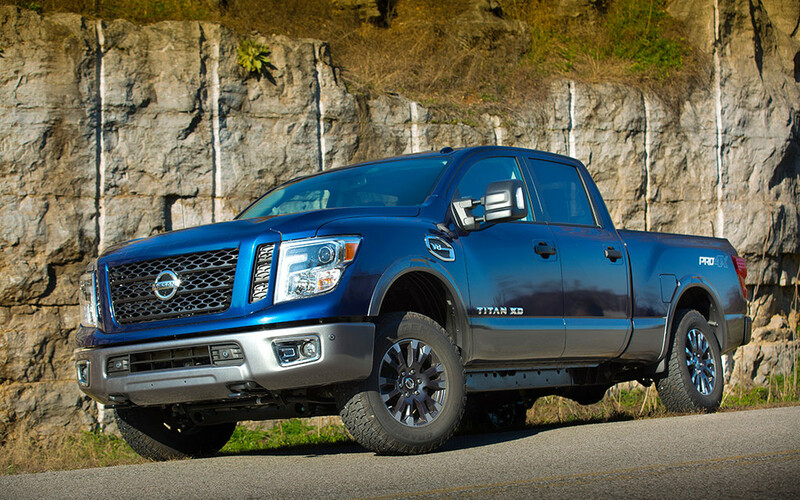 It added that the truck, including the non-XD Titan, will be available in three cab configurations, two frame sizes and with three powertrain choices after the both gas and diesel version of the Nissan Titan XD hit the market. Freight adds $1,730 to all models. All gas versions of the Titan XD come equipped with a seven-speed automatic transmission. Fuel economy, towing and payload information should be available closer to launch. And fear not: Less expensive versions of the Titan should be available some time this summer or fall.